For other uses, see Battle of Shanghai (disambiguation). The Battle of Shanghai was the first of the twenty-two major engagements fought between the National Revolutionary Army of the Republic of China and the Imperial Japanese Army of the Empire of Japan during the Second Sino-Japanese War. It was one of the largest and bloodiest battles of the entire war. Since 1931, China and Japan had been embroiled in incessant, smaller conflicts, often known as "incidents," that saw China lose territories piece by piece. The term "incident" was used by the Japanese Imperial High Command to play down the Japanese invasions of China. Although Japan had not formally declared war on China, by August 1937, following the Marco Polo Bridge Incident of July 7 and the ensuing Japanese invasion of North China, a de facto state of war existed between China and Japan. Dogged Chinese resistance at Shanghai was aimed at stalling the rapid Japanese advance, giving much needed time for the Chinese government to move vital industries to the interior, while at the same time attempting to bring sympathetic Western Powers to China's side. During the fierce three-month battle, Chinese and Japanese troops fought in downtown Shanghai, in the outlying towns, and on the beaches of the Jiangsu coast, where the Japanese had made amphibious landings. The Chinese soldiers had to rely primarily on small-caliber weapons in their defense of Shanghai, against an overwhelming onslaught of air, naval, and armored striking power from Japan. In the end, Shanghai fell, and China lost a significant portion of its best troops, while also failing to elicit any international intervention. The resistance of Chinese forces, however, came as a massive shock to the Japanese invaders,[Clarification needed] who had been indoctrinated with notions of cultural and martial superiority, and dramatically demoralized the Japanese army. The battle can be divided into three stages, and eventually involved nearly one million troops. The first stage lasted from August 13 to August 22, during which the Chinese army attempted to eradicate Japanese troop presence in downtown Shanghai. The second stage lasted from August 23 to October 26, during which the Japanese launched amphibious landings at Jiangsu coast and the two armies fought a Stalingrad-type house-to-house battle, with the Japanese attempting to gain control of the city and the surrounding regions. The last stage, ranging from October 27 to the end of November, involved the retreat of the Chinese army in the face of Japanese flanking maneuvers, and the ensuing combat on the road to China's capital, Nanjing. In Chinese, the Battle of Shanghai is known as the Battle of Songhu (Script error). Song (淞) comes from Wusong (吳凇), an alternate name of Suzhou Creek, which runs through Shanghai. Hu (滬) is the abbreviation for the city itself. In Chinese literature, the battle is also referred to as 813, denoting August 13, the date when battle began. In some Japanese sources, the battle is known as the "Second Shanghai Incident" (第二次上海事変, Dai-niji Shanhai jihen? )Script error, alluding to the First Shanghai Incident of 1932. However, the 1937 Battle of Shanghai was a full-scale battle signifying the beginning of an all-out war between the two countries. The Battle of Shanghai was the first major battle of the Second Sino-Japanese War and escalated the skirmish of the Marco Polo Bridge Incident and the localized war in North China into a full-scale war that would involve most major regions of China. There were several underlying causes for this. Since the outbreak of the war on July 7, 1937, most combat had occurred in and around North China in operations collectively known as the Battle of Beiping-Tientsin. Originally, neither China nor Japan wanted the skirmish to escalate into a full-scale war. Japan expected a quick ceasefire and further gains of Chinese territory, similar to what had happened earlier in the Mukden Incident (1931), January 28 Incident (1932), the Great Wall Incident (1933), and various other settlements brokered in the mid-1930s. Generalissimo Chiang Kai-shek saw the Marco Polo Bridge Incident as the boldest attempt yet by Japan to completely separate northern provinces from Chinese control and incorporate them into the Japanese puppet state of Manchukuo. In the wake of the Second United Front formed after the Xi'an Incident, this event broke the "Final Point" (最後關頭) of Chiang's tolerance of Japanese aggression according to his policy of "internal pacification before external resistance." Chiang decided to initiate a full-scale war with Japan. Chiang Kai-shek and his advisers believed that the next logical step for the Japanese army was to march from North China, along the Peiping-Hankou and Peiping-Pukou railways, and cut right into Wuhan and areas of Central and East China. The Japanese north-to-south advance meant that the Chinese army had to defend along a horizontal axis, to attempt to encircle the advancing enemy through pincer movement. However, the Chinese army was simply incapable of such maneuvers, whereas the Japanese Imperial Army had qualitative superiority in North China, and the mobility of its armor and artillery pieces was unmatched. Chinese military presence in North China was minimal, and the central government and the Kuomintang itself were banned from conducting political activity in Hebei province as a result of the He-Umezu Agreement. In addition, most of the more robust Chinese defense works were not built in North China, but in East China, along the lower Yangtze Delta. Also as important, Japanese troops were being reinforced easily from Japan, through Korea and Manchukuo, and finally to North China through efficient naval and rail transports. Chinese troop movement was severely handicapped by the lack of sufficient motorized vehicles and adequate railway lines. The vast majority of Chinese troops had reached the front line simply by marching. It took considerably longer for Chinese reinforcements from South China to reach North China than it did for the Japanese to reinforce from their home islands. This meant transferring the Chinese army to fight a war in North China was impractical. In addition, if the Japanese army had made a southward advance and invaded Wuhan and then turned eastward with a push toward East and Central China and encircled the Shanghai-Nanjing region, Chinese defenders would have been chased to the sea in a scenario similar to the future Battle of Dunkirk. The Imperial Japanese Navy (IJN) had total supremacy in Chinese seas and the retreating Chinese forces would have been decimated by the enemy as they had nowhere to retreat. Under this scenario, Chiang decided to establish a second front in Shanghai, with the intention of drawing enemy troops to the East and Central China Theater. Public opinion and patriotism were also strong factors in Chiang's decision to pursue a full-scale war with Japan. Throughout the 1930s, the central government had lost considerable public support because it was preoccupied with the pacification of insurrections before mounting a full-scale war against Japan (攘外必先安内). However, having emerged from the peaceful resolution of the Xi'an Incident, Chiang Kai-shek attained unprecedented popularity as he was seen as the only national leader capable of conducting the war against Japan. It was impossible for him to back down as it would have doomed his political career. Originally, Chiang believed that China needed at least several years of internal peace and unity to build up a national army and sufficient industries to fight Japan on the same footing. Chiang feared that a premature war would put an end to his preparatory plans, and thus opted for fighting small, localized "incidents" that were characteristic of Sino-Japanese conflicts in the 1930s. On the other hand, if Chiang decided to put up an all-out resistance, he risked losing his newly reorganized divisions that were barely ready to meet the enemy head-on, in addition to the complete destruction of China's nascent industrial base. Essentially, for Chiang, fighting a full-scale war would bolster his public image among the Chinese, but would undermine his political leverage, which was based on military strength, against other regional powers. However, stepping down and making more concessions would make him appear unpatriotic and lose public support, but would maintain his military power. The Battle of Shanghai and the decision for total war would prove to be a great gamble for Chiang. Chiang also could not afford losing Zhejiang and Jiangsu provinces to Japanese hands. Both Nanjing, the capital of the Republic of China at the time, and Shanghai were situated in Jiangsu province. The two provinces were also the economic powerhouse of the lower Yangtze Delta region, and much of the industrial progress and political foundation of the "Nanjing Decade" were developed here. The region was also the only place in China where the central government under Chiang Kai-shek had unopposed political authority, since North China had been under Japanese influence, and other provinces were subject to the control of remnant warlords or other Kuomintang militarist factions. Thus, Chiang also had to defend Shanghai at all costs since it was situated at the core of his political and economic administration. Shanghai was a diverse cosmopolitan city and had investments and assets from most major international powers, such as the United States, the United Kingdom, and France. Traditionally, Western Powers had been unwilling to condemn Japanese aggression because of their preoccupation with the situation in Europe and Japan's anti-Soviet Union political agenda. However, a Japanese invasion of the city would provide an impetus for the West to enter the war on the side of China. It was obvious that the war would undercut western commercial investments and make them propose a quick settlement on terms acceptable to China. In addition, Japan could not possibly sustain a war against the United States, the greatest economic power, and the United Kingdom, the greatest colonial power. However, appeasement and isolationism permeated the international community and past experience from the 1930s had made it clear that Japanese excursions would not be acted upon by the international powers, other than some ineffective condemnations from the League of Nations. Already in 1935, Chiang's German advisor, General Alexander von Falkenhausen, told him that the Nine-Power Treaty was little more than a scrap of paper and that he should place no hope that the international community would come to intervene. Chiang was advised that China must be prepared to fight alone for at least two years of the war, regardless of any changes in the international situation. Chiang and his advisers were also somewhat confident in raising the stakes of the battle, since the Chinese army had fought the Japanese to a standstill in the January 28 Incident, also known as the First Shanghai Incident, in 1932. Because the Shanghai Ceasefire Agreement of 1932, signed after the incident, forbade the Chinese from deploying any troops within Shanghai, the Chinese trained its police garrison, whose presence was allowed in the city, in various military tactics unusual for a police force. The planning of the defense of Shanghai was overseen by Zhang Zhizhong, a veteran of the 1932 incident. Since China did not possess adequate artillery and armor, Zhang Zhizhong believed that the Chinese army should use their numerical superiority and take the initiative, and push the Japanese into the sea before they had a chance to reinforce. In 1933, three military zones, Nanjing, Nanjing-Hangzhou, and Nanjing-Shanghai, were established to coordinate defenses in the Yangtze Delta. In 1934, with German assistance, the construction of the so-called "Chinese Hindenburg Line" began, with a series of fortifications to facilitate defense in depth. Two such lines, the Wufu Line (吳福線) between Suzhou and Fushan, and the Xicheng Line (錫澄線) between Wuxi and Jiangyin, were in position to protect the road to Nanjing, in case Shanghai should fall into enemy hands. In spring 1937, just barely months before the beginning of the Second Sino-Japanese War, the lines were finally completed. However, the necessary training of personnel to man these positions and coordinate the defense had not yet been completed when the war broke out. Since the outbreak of war on July 7, Japan had focused on conducting military operations primarily in North China, which included provinces such as Hebei, Shanxi, and Chahar. The Japanese invasion further increased the frequency of anti-Japanese protests, and boycotts of Japanese goods had serious repercussions upon Japanese trade in China. The effect was strongly felt in Shanghai because there were many Japanese commercial interests in the city. The Imperial Japanese Navy had insisted on escalating troop presence to protect both Japanese factories and citizens from a possible confrontation with the Chinese, but the Imperial Japanese Army consistently refused to cooperate until early August. One reason for this was that the Japanese Army did not wish to deploy in East and Central China, for fear that such action would create a vacuum in North China and Manchukuo, which bordered the Soviet Union. Japan saw the Soviet Union as the primary military threat on the Chinese mainland and did not want to divert attention away from North China. The Japanese Army Command also did not wish to deploy troops into Central China, because doing so might steer Japan into confrontations with other foreign powers present in the region. In addition, the Japanese Army Command had a very low opinion of Chinese fighting capability, and believed that since China had almost always been mired in the civil wars, Chiang Kai-shek would focus on national unification first and would not risk his troops against the vastly superior Japanese. In the view of the Japanese Army Command there was no need for the Imperial Japanese Army to enter Central China. Thus, Japan wished to defeat China and conclude the war as soon as possible, to avoid disrupting its plans against the Soviet Union. However, the Japanese Naval Command insisted on deploying troops in Central China to destroy any Chinese troops that might be dispatched to North China, where the war was localized. Following the Oyama Incident of August 9, conflict in Shanghai seemed inevitable. On August 10, naval commander-in-chief Mitsumasa Yonai voiced his demand in a cabinet meeting. He was opposed by army generals Ishiwara Kanji and Umezu Yoshijiro, who insisted that the Shanghai front should be the responsibility solely of the Imperial Navy. After some negotiation, the Army Command acceded to the navy's demand and began deploying troops to the Shanghai region on August 10. The Japanese military was confident they could overcome Chinese forces in Central China within three days and end the entire war in three months. The Japanese had military garrisons within the city while Chinese military presence, aside from a small military police garrison, known as the Peace Preservation Corps (保安隊), and some fortifications, was strictly forbidden under the Shanghai Ceasefire Agreement. The Japanese had many factories and warehouses in the city, and most of them were reinforced for military purposes. The Japanese marines headquarters was near a textile mill and there were more than eighty emplacements and bunkers of various types in the city. The Japanese Third Fleet also had ships patrolling the rivers that ran through Shanghai, and the city was well within the firing range of their guns. In all, the Japanese army was well prepared to meet the numerically superior, but under-equipped and poorly trained Chinese army. Ōyama Incident on August 9, 1937. On August 9, Lieutenant Isao Ōyama (大山勇夫? )Script error of the Japanese Marines was shot dead by Chinese Peace Preservation Corps troops stationed near Hongqiao Airport (虹橋機場). It is still unknown whether Ōyama attempted to enter the military airport or not. Mao Zedong biographers Chang and Halliday assert that Chinese Army General Zhang Zhizhong was a Communist Party sympathizer, and staged the Ōyama Incident, including bringing a Chinese soldier condemned for an unrelated crime and killing him with Lt. Ōyama's gun, to heighten credibility. Chang and Halliday point out that Gen. Zhizhong defied orders in publicizing the incident widely with the news media after it happened. They also quote Mao as saying that all-out war between Japan and China would weaken Chiang Kai-Shek's government, giving Mao's less-numerous Communists an advantage. Regardless, the Ōyama Incident heightened the tension in Shanghai. On August 10, the Japanese Consul General demanded that the Chinese withdraw the Peace Preservation Corps and dismantle their defence works around the city. He also made it clear that the shooting of a Japanese officer was regarded by the Imperial Army as humiliating, and that even the slightest further provocation could cause the situation to explode. The incident also caused Japan to send reinforcements to the Shanghai area on August 10. In response to Japanese troop movements, Chiang Kai-shek began deploying Chinese troops to the Shanghai area on August 11. On August 12, representatives of the major powers convened and Japan demanded the powers enforce the withdrawal of Chinese troops from Shanghai, but mayor Yu Hung-chun protested that Japan had already violated the agreement through its invasion of China on July 7. The major powers did not wish to see another January 28 Incident, which greatly disrupted foreign economic activities in Shanghai. On the other hand, Chinese citizens feverishly welcomed the presence of Chinese troops in the city. In Nanjing, Chinese and Japanese representatives met for the last time for final efforts at negotiation. The Japanese demanded that the Chinese withdraw all Peace Preservation Corps from Shanghai and all regular troops from the vicinities of the city. The Chinese insisted that the Japanese demand of a unilateral Chinese withdrawal was unacceptable since the two countries were already fighting a war in North China. At last Mayor Yu made it clear that at most the Chinese government would concede that the Chinese troops would not fire unless fired upon. Japan on the other hand placed all responsibility on China because of Chinese deployment of troops around Shanghai. Negotiation was impossible and there was no alternative other than the spread of war into Central China. Around 9am on August 13, the Chinese Peace Preservation Corps exchanged small arms fire with Japanese troops in the Zhabei, Wusong, and Jiangwan districts of Shanghai. About 3pm the Japanese army crossed over the Bazi Bridge (八字橋) in Zhabei District and attacked various centers in the city. The Chinese 88th Division retaliated with mortar attacks. Sporadic shooting continued through the day until 4pm, when Japanese headquarters ordered ships of the Third Fleet, stationed in the Yangtze and the Huangpu River to open fire on Chinese positions in the city. Late that night, Chiang Kai-shek ordered Zhang Zhizhong to begin Chinese offensive operations the next day. The next morning the Chinese air force began bombing various Japanese targets and Chinese ground forces attacked at 3pm. On the same day, August 14, the Chinese government issued the Proclamation of Self-Defense and War of Resistance (自衛抗戰聲明書), explaining the government's resolve against Japanese aggression. The Battle of Shanghai had officially begun. Zhang Zhizhong's initial plan was to have the numerically superior Chinese forces attack the Japanese by surprise and push them into the Huangpu River, then blockade the coast to deny the Japanese the opportunity to land reinforcements at the Huangpu wharves between Yangshupu (楊樹浦) and Hongkou (虹口). The Chinese 88th Division was to attack Japanese army headquarters near Zhabei, and the 87th Division was to attack the reinforced Kung-ta Textile Mill, where the Japanese naval command was located. Zhang estimated it would take one week to achieve the objectives, however, the operation ran into trouble when his troops were fought to a standstill just outside the International Settlement. Japanese strongholds were fortified with thick concrete and were resistant to 150mm howitzers, the only heavy weapons the Chinese possessed. Chinese troops could only advance, under the cover of machine gun fire, by getting close enough to the emplacements to kill those within with hand grenades. The Chinese advance was greatly slowed and the element of surprise was lost. Lacking the heavy weapons to destroy the Japanese bunkers directly, Zhang Zhizhong, decided to encircle them instead. On August 16, he ordered his men to take the streets surrounding the Japanese strongholds. Every time a street was successfully cleared, the Chinese would set up a sandbag blockade, gradually surrounding each stronghold and closing off all possible routes of escape. The tactic was successful at first and the Chinese were able to destroy many emplacements and outposts in a single day. However, the Japanese then deployed tanks in the broad streets, enabling them to easily repel the Chinese attacks and defeat the encircling strategy. On August 18, the Chinese attack was called off. On August 18, Chen Cheng reached the front lines to discuss the situation with Zhang Zhizhong. They decided to send the newly arrived 36th Division into the fray, attacking the Hueishan (匯山) docks on the northern side of the Huangpu River. Meanwhile, the 87th Division broke through Japanese lines at Yangshupu, and pushed onto the Hueishan docks along with the 36th Division. On August 22, the tanks of the 36th Division reached the docks, but were not able to hold the position for long. The Chinese troops were insufficiently trained in coordinating infantry-tank tactics, and the troops were unable to keep up with the tanks. Without sufficient infantry to protect them, the tanks were vulnerable to Japanese anti-tank weapons and artillery in close quarters and became useless when they entered the city center. The few troops who did manage to keep up with the tanks through the city blocks were then trapped by Japanese blockades and annihilated by flamethrowers and intense machine gun fire. While the Chinese almost succeeded in pushing the Japanese down the Huangpu River, the casualty rate was exceedingly high. During the night of August 22 alone, the 36th Division lost more than ninety officers and a thousand troops. On August 22, the Japanese 3rd, 8th, and 11th Divisions made an amphibious assault under the cover of naval bombardment and proceeded to land in Chuanshakou (川沙口), Shizilin (獅子林), and Baoshan (寶山), towns on the northeast coast some fifty kilometers (31 miles) away from downtown Shanghai. Japanese landings in northeast Shanghai suburban areas meant that many Chinese troops, who were deployed in Shanghai's urban center, had to be redeployed to the coastal regions to counter the landings. Thus, the front line was lengthened from metropolitan Shanghai along the Huangpu River to the northeast coastal districts. The Chinese offensive in the urban center had ground to a halt, and the fighting in downtown Shanghai essentially became a stalemate with both sides suffering heavy losses and making minimal changes in the front line. The Chinese divisions were able to hold on to Zhabei, Jiangwan, and other downtown positions for three months, until situations in other areas made it strategically impossible to continue defending these positions. Before Shanghai's Cathay Hotel after a National Revolutionary Army (Republic of China) bombing run on August 14, 1937. German Newsreel about the attack, September 1937. On August 15, the Japanese formed the Shanghai Expeditionary Army, composed of the 3rd and 11th Divisions, under the command of General Iwane Matsui. On August 19, Japanese Prime Minister Fumimaro Konoe announced that the Sino-Japanese conflict could only be resolved through war, regardless of any attempts at negotiation by third party nations. Konoe said that the initial plan of localized "containment" around the Shanghai region had now escalated to total war, with the ultimate goal of forcing the Chinese government to cooperate with Japan economically and politically. On August 23, the Japanese began the bombing campaign over Nanjing, and various cities in Central China. The Shanghai Expeditionary Army also arrived on this day. 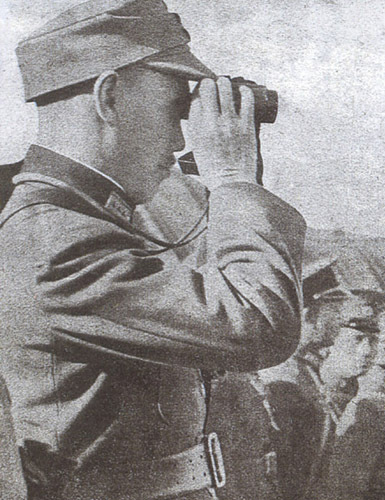 At the beginning of the battle, Zhang Zhizhong, as the commander of the 5th Army and the Nanjing-Shanghai war zone, was responsible for conducting Chinese operations. The failure of the initial Chinese offensive greatly dismayed Chiang Kai-shek and his staff. Chiang criticized Zhang's failure to make sufficient preparations, especially the procurement of weapons capable of penetrating Japanese bunkers, before sending in troops in waves, which resulted in many divisions sustaining a huge number of casualties right from the beginning. Zhang was also criticized for his overconfidence and his penchant of holding press conferences, for both foreign and Chinese reporters in the cosmopolitan city. Chiang Kai-shek and his staff, the most prominent including Chen Cheng and Gu Zhutong, began taking over command duties from Zhang Zhizhong. Chiang Kai-shek himself would eventually become the commander of the 3rd Warzone that oversaw Shanghai. The failure of the Chinese offensive showed that even though the Chinese army initially outnumbered the Japanese garrison, it still could not achieve its objective, given its lack of heavy weapons and artillery. In addition, the Japanese fleet was ubiquitous in Shanghai waters and their naval guns bombarded Chinese positions in the city with pinpoint accuracy. Given such odds, the Japanese offense was almost certain to succeed. The bloodiest and most intense period of fighting occurred in the period from August 23, when the Japanese began landing in waves, to October 26, when the Chinese retired from metropolitan Shanghai. During this period, the majority of combat concentrated along the 40 kilometer line from metropolitan Shanghai to the town of Liuhe (瀏河), located northeast to the city on the coast where the Japanese made their landings. On August 23, the Japanese Shanghai Expeditionary Army, led by Iwane Matsui, landed in Liuhe, Wusong (吳淞), and Chuanshakou. Chiang Kai-shek had expected these coastal towns to be vulnerable to Japanese landings and ordered Chen Cheng to reinforce the area with the 18th Army. However, the Chinese were no match for Japanese firepower. The Japanese almost always began their amphibious assaults with heavy naval and air bombardment of the Chinese coastal defense works and trenches. It was not unheard of for the Chinese to lose an entire garrison to such bombardments. However, the Chinese would reinforce almost immediately to counter the Japanese troops who had just made their landing after the bombardment. In the two weeks that followed, the Chinese and Japanese troops fought bitter battles in the numerous towns and villages along the coast. The Chinese troops fending off the amphibious assaults had only their small-caliber weapons to depend on, and were not sufficiently supported by the Chinese air force and the almost nonexistent Chinese navy. They paid heavily for the defense. An entire regiment could be reduced to just a few men in action. In addition, Chinese coastal defense works were hastily constructed and did not offer much protection against enemy attacks, as many trenches were newly constructed during lulls in fighting. Moreover, the sandy soil of the coastal region meant that it was difficult to construct sturdy fortifications. Many trenches would collapse due to rain. It was a race against time to construct and repair these defense works despite constant Japanese bombardment. Logistics difficulty also meant it was hard to transport the necessary construction materials to the front line. The Chinese often had to turn to bombed-out houses to obtain bricks, beams, and other such materials. However, the Chinese fought against great odds and tried to hold on to the coastal villages as long as they could. It was commonplace for the Japanese to successfully occupy the towns in the day under heavy naval support, only to lose them during the night to Chinese counterattacks. Such attacks and counterattacks continued well into late August, when the fall of Baoshan, a vital coastal town, seemed imminent. Chiang Kai-shek ordered the remaining troops of the 98th Division to defend the town. 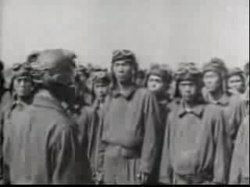 One battalion, under Yao Ziqing (姚子青), was assigned to the task. The situation in Baoshan was grim, as the Japanese had surrounded the town on September 5. However, Yao ordered his men to defend to the death. Japanese artillery strikes reduced the town to rubble, and Yao was killed in house-to-house fighting. On September 6 Baoshan fell. The entire battalion, except for one soldier, was killed in action. The Chinese would continue to sustain this level of casualties throughout the Shanghai campaign. On September 11, with the fall of Baoshan, the Chinese Army moved into defensive positions around Luodian (羅店). Luodian was only a small town, but it was the transportation center connecting Baoshan, downtown Shanghai, Jiading, Songjiang and several other towns with highways. Therefore, the successful defense of Luodian was strategically paramount to the security of Suzhou and Shanghai. As early as August 29, German adviser Alexander von Falkenhausen told Chiang Kai-shek that the town of Luodian had to be held at all costs. For the fight for Luodian, the Chinese concentrated some three hundred thousand soldiers, while the Japanese amassed more than one hundred thousand troops, supported with naval ships, tanks and airplanes. The carnage and intensity of the resulting battle earned the fight for Luodian the nickname "grinding mill of flesh and blood" (血肉磨坊). The Japanese offensive usually began at daybreak with concentrated aerial bombing, followed by the release of observation balloons to pinpoint the exact location of remaining Chinese positions for artillery and naval strikes. Japanese infantry would then advance under smoke screen and armored support. Japanese planes would also accompany the infantry and strafe Chinese reinforcements. Chinese defense was stubborn even in the face of such overwhelming firepower. 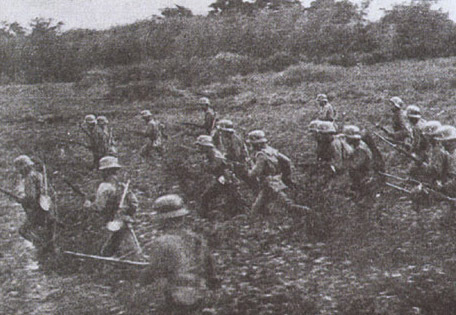 During the night, Chinese soldiers mined the roads connecting the coastal towns to Luodian and engaged in night combat to cut off Japanese advance troops. At daybreak, the Chinese would garrison the foremost defensive lines with comparatively fewer troops to reduce casualties resulting from intense Japanese bombardments. The Chinese would then emerge from rear positions to engage the enemy when the Japanese land offensive started after naval and artillery strikes had ceased. Despite their numerical superiority, the defense of Luodian would prove to be impossible for the Chinese. The Japanese had a number of advantages, including superiority of firepower, and the fact that the Chinese were in a passive position to face the onslaught, because they were not able to mount effective offensives until the Japanese were practically on top of Luodian. Because of this, the Chinese decided to defend to the death to hold on to every square inch of the town. This tactic greatly accelerated the attrition rate within the Chinese ranks. The casualty rate of General Chen Cheng's army group was more than fifty percent. By the end of September, the Chinese had been almost bled dry and were forced to give up Luodian. On October 1, on advice from his commanders, Japanese Prime Minister Fumimaro Konoe decided to integrate and escalate the combat in the North China and Central China Theaters and launch an October offensive to subjugate the Chinese government and end the war. By this time, the Japanese had increased troop strength in the Shanghai region to more than two hundred thousand. Japanese troops also invaded the town of Liuhang (劉行), south of Luodian. Thus, the frontline moved further south onto the banks of the Yunzaobin River (蘊藻濱). The Japanese aim was to cross the Yunzaobin River and take the town of Dachang (大場), which was the communications link between Chinese troops in downtown Shanghai and the northwest outlying towns. If Dachang had fallen, the Chinese troops would have to give up their positions in downtown Shanghai and regions east of the Huangpu River to avoid encirclement by the Japanese army. The defense of Dachang was vital to how long the Chinese army could stay and continue fighting in the Shanghai war zone. For this, Chiang Kai-shek mobilized whatever remaining troops he could salvage for the defense of Dachang. The two armies engaged in seesaw battles, with little changes in the frontline along the Yunzaobin River. From September 11 to October 20, the Japanese army was able to advance only five kilometers. At the most intense moments, the positions would change hands five times a day. On October 17, the Guangxi Army under Li Zongren and Bai Chongxi finally arrived to join Chiang Kai-shek's Central Army in the battle for Shanghai. The Chinese then staged a final counteroffensive in an attempt to fully consolidate Chinese positions around Dachang and retake the banks of the Yunzaobin River. However, the counteroffensive was poorly coordinated and again the Chinese succumbed to superior Japanese firepower. The Japanese utilized some 700 artillery pieces and 150 bombers for the Dachang operation and the town was totally reduced to rubble. The fighting was so fierce that the average Chinese casualty rate per hour was in the thousands, and some divisions were incapacitated in a matter of just a few days. This fierce fighting continued until October 25, when Dachang finally fell. By then, Chinese troops had no option but to withdraw from downtown Shanghai, which they had held for almost three months. Starting the night of October 26, the Chinese began withdrawing from Shanghai urban center. Because Dachang and other vital suburban towns had been lost already, Chiang Kai-shek ordered the Chinese troops to retreat from Zhabei, Jiangwan (江灣), and other positions that the troops had held for seventy-five days without faltering. 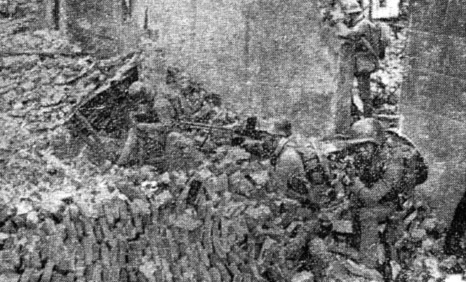 However, Chiang ordered one battalion of the 88th Division remain in Zhabei to defend the Sihang Warehouse on the northern bank of the Suzhou Creek. Chiang could not fully retire from downtown Shanghai because the Nine-Power Treaty conference was in session in Brussels for a possible Western intervention in the Sino-Japanese conflict. The rest of the Chinese troops crossed the Suzhou Creek and regrouped for the final showdown with the Japanese army. Chiang's original plan was to fight in areas south of the Suzhou Creek and inflict as many Japanese casualties as possible. However, through three months of intense fighting, Chinese troop strength had been greatly reduced. Most units had their strength halved, and as a result a division had the fighting capability of less than two regiments. By now, the Chinese army needed between eight to twelve divisions to match the fighting strength of just one Japanese division. Thus, Chinese commanders were pessimistic about the outcome of the Suzhou Creek combat. Li Zongren, Bai Chongxi, Zhang Fakui and other commanders insisted that the Chinese troops should enter the Wufu and Xicheng defense lines to protect Nanjing, but Chiang wanted the Chinese troops to continue fighting on the southern bank of Suzhou Creek. On October 28, Chiang arrived in the battlefield to boost the morale of his troops. However, the situation was bleak. On October 30, the Japanese crossed Suzhou River and the Chinese troops were in danger of encirclement. The Chinese army was at its limit of endurance. As early as October 12, the Japanese chiefs of staff had already formulated plans to force a landing in Jinshanwei (金山衛), a town located on the northern bank of Hangzhou Bay, south of the Shanghai region. The Jinshanwei landings would facilitate a northward push into Shanghai, to complement the landings in northeastern towns, such as the ones around Baoshan between late August and mid-September, which brought about a southward push. Chiang Kai-shek was aware of the Japanese plan to encircle his army in Shanghai from the north and the south, and had already ordered his commanders to take precautions of the possible Japanese landings at Jinshanwei. However, the impending fall of Dachang in late October forced Chiang to redeploy the Chinese divisions originally stationed along the northern coast of Hangzhou Bay. 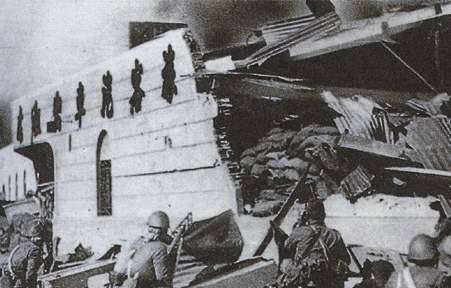 As a result, the lack of Chinese defenses allowed the Japanese 10th Army Corps, composed of units diverted from the Battle of Taiyuan in the North China Theater, to land easily in Jinshanwei on November 5. Jinshanwei was only forty kilometers away from the banks of Suzhou River where the Chinese troops had just retreated from the fall of Dachang. In October, the SEF was reinforced by the Japanese 10th Army commanded by Lieutenant General Heisuke Yanagawa. On 7 November, Japanese Central China Area Army (CCAA) was organized by combining the SEF and the 10th Army, with Matsui appointed as its commander-in-chief concurrently with that of the SEF. After winning the battles around Shanghai, the SEF suggested the Imperial General Headquarters in Tokyo to attack Nanking. Nanjing is the capital of China and the capture thereof is an international affair; therefore, careful study should be made so as to exhibit the honor and glory of Japan and augment the trust of the Chinese people, and that the battle in the vicinity of Shanghai is aimed at the subjugation of the Chinese Army, therefore protect and patronize Chinese officials and people, as afar as possible; the Army should always bear in mind not to involve foreign residents and armies in trouble and maintain close liaison with foreign authorities in order to avoid misunderstandings. On December 2, Emperor Showa nominated one of his uncles, Prince Asaka, as commander of the invasion. It is difficult to establish if, as a member of the imperial family, Asaka had a superior status to general Iwane Matsui, who was officially the commander in chief, but it is clear that, as the top-ranking officer, he had authority over division commanders, lieutenant-generals Kesago Nakajima and Heisuke Yanagawa. 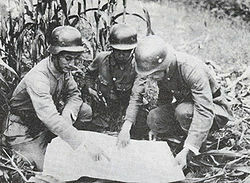 After securing control of Shanghai, the Japanese army began its advance towards Nanjing on November 11, 1937, approaching the city from different directions. The Japanese advance to Nanjing can be characterized as a "forced march". Almost all units covered the distance of almost 400 kilometers in about a month. Assuming that capture of the Chinese capital would be the decisive turning point in the war, there was an eagerness to be among the first to claim the honor of victory. The Japanese army was engaged by Chinese soldiers on a number of occasions on the way to Nanking. As a general rule, they were heavily outnumbered. As the Japanese came closer to Nanjing, the fighting grew in both frequency and severity. 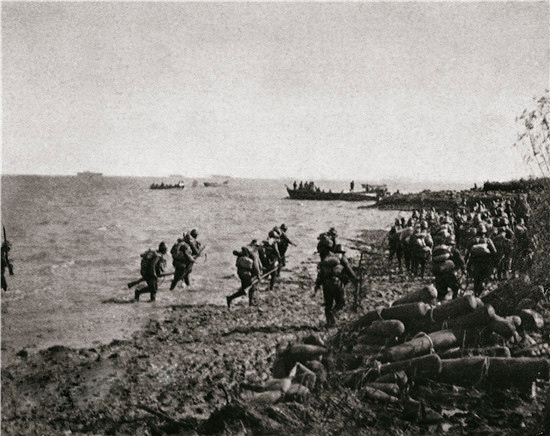 Japanese landings at Jinshanwei meant that the Chinese army had to retire from the Shanghai front and attempt a breakout. However, Chiang Kai-shek still placed some hope that the Nine-Power Treaty would result in a sanction against Japan by Western Powers. It was not until November 8 that the Chinese central command issued a general retreat to withdraw from the entire Shanghai front. All Chinese units were ordered to move toward western towns such as Kunshan, and then from there enter the final defense lines to stop the Japanese from reaching Nanjing. By then, the Chinese army was utterly exhausted, and with a severe shortage of ammunition and supplies, the defense was faltering. Kunshan was lost in only two days, and the remaining troops began moving toward the Wufu Line fortifications on November 13. The Chinese army was fighting with the last of its strength and the frontline was on the verge of collapse. In the chaos that ensued many Chinese units were broken up and lost contact with their communications officers who had the maps and layouts to the fortifications. In addition, once they arrived at Wufu Line, the Chinese troops discovered that some of the civilian officials were not there to receive them as they had already fled and had taken the keys with them. 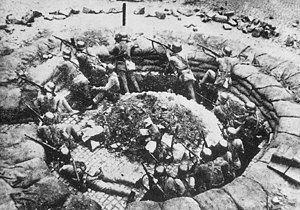 The battered Chinese troops, who had just emerged from the bloodbath in Shanghai and were hoping to enter the defense lines, found that they were not able to utilize these fortifications. The Wufu Line was penetrated on November 19, and the Chinese troops then moved toward Xicheng Line, which they were forced to give up on November 26 in the midst of the onslaught. The "Chinese Hindenburg Line," which the government had spent millions to construct and was the final line of defense between Shanghai and Nanjing, collapsed in only two weeks. The Battle of Shanghai was over. However, fighting continued without a pause on the road to China's capital and the ensuing combat immediately led into the Battle of Nanjing. By early December, the Japanese troops had reached the outskirts of Nanking. Japanese soldiers pose next to a bronze statue of Sun Yat-sen after capturing Shanghai. China's officer corps took a particularly strong hit in the battle. Even though the Battle of Shanghai was only the first of the twenty-two major battles fought between China and Japan, Chiang Kai-shek's decision to send his best troops into the battle had significant repercussions. At the outbreak of the war, the Chinese National Revolutionary Army boasted a standing army of some 1.75 million troops, but in reality Chinese military strength was significantly lower. This was because almost all of the troops were poorly trained, poorly equipped, and semi-literate peasants who had little concept of modern warfare. Only about 300,000 were comparatively better trained and were reorganized into some 20 newly adjusted divisions. Of these, around 80,000 were the German-trained divisions that composed the elite units of Chiang Kai-shek's Central Army. However, even these divisions were not sufficiently supported by combined arms. Thus, out of a grand total of almost two million men-in-arms, less than one hundred thousand Chinese troops were able to fight Japan on more or less equal terms. Chiang Kai-shek's decision to pit all of his crack divisions to fight in Shanghai caused his elite units to suffer some sixty percent casualties in the three-month bloodbath. In one single blow, Chiang also lost some 10,000 of the 25,000 junior officers trained by the elite Central Military Academy between 1929 and 1937, in addition to some tens of thousands of potential military officers. 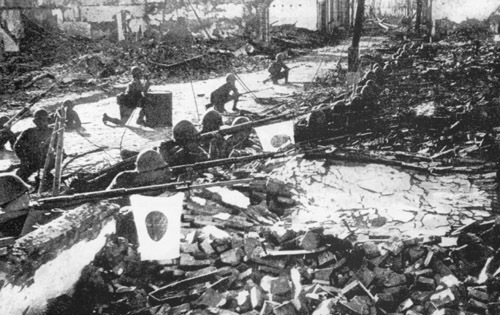 Chiang Kai-shek's Central Army was never to recover from these devastating losses. By the time the 88th Division, arguably the best of these elite divisions, began its defense of Nanjing, it had been reduced to seven thousand men, of whom three thousand were new recruits to replace the lost veterans. The destruction of his own military strength also forced Chiang to rely on non-Whampoa generals, who commanded the provincial armies and many of whom had questionable loyalty. Because of his reduction in military power, Chiang lost some political leverage to local warlords. In effect, Chiang Kai-shek was effectively only the head of a loose coalition, rather than the commander-in-chief of a united fighting force. The sapping of China's best fighting men also made the planning and execution of subsequent military operations difficult. In essence, Chiang Kai-shek's concerted pre-war effort to build a truly effective, modernized, national army was greatly devastated by the sacrifices made in the Battle of Shanghai. A major reason that the Chinese army held onto the city as long as it did, even though it was on the brink of collapse, was that China was hoping for a western intervention in the Sino-Japanese War. Western nations had been paying little attention to China's plight since they were preoccupied with the situation in Europe. In addition, most western nations had little prospect that their intervention would help China in the long run because they believed that China would eventually lose. If China was deemed militarily weak, economically backward, and politically disunited by Western powers, it would not make sense for them to help China when it seemed bound for defeat by Japan. Thus, Chiang Kai-shek had to devote everything China had to offer to make sure the Western powers know that the present conflict between China and Japan was a major war, not a collection of inconsequential "incidents" as had been the case previously. Based on this political strategy, Chiang Kai-shek had to order his troops to fight to the death in an attempt to arouse international sympathy and cause the international community to adopt measures that would help China and sanction Japan. On September 12, one month after the Battle of Shanghai began, China formally brought the case against Japan to the League of Nations. Again, the League was not able to formulate any effective sanctions against Japan other than an October 4 statement that gave China "spiritual support." The United States was not a member of the League and Great Britain and France were reluctant to challenge Japan. Of all the major western powers, only the United States seemed able to act more since it was not embroiled in the volatile European affairs. In addition, on October 5, President Franklin D. Roosevelt gave the Quarantine Speech, calling for the United States to help nations fight against aggressor nations. This speech had a tremendous effect on raising China's morale. Because America seemed willing to confront Japan, the British representative suggested to close the League case and convene the Nine Power Treaty Conference. Since the Nine-Power Treaty was signed as a result of the Washington Naval Conference of 1922, the opening of the Conference automatically brought the United States into the effort to rein in Japanese aggression. American entry into the international response brought new hope to the Chinese, and Chiang Kai-shek again reiterated the need for his troops to hold on to Shanghai to prove that China was indeed worth fighting for. By mid-October, Chinese situation in Shanghai had become increasingly dire and the Japanese had made significant gains. The vital town of Dachang fell on October 26 and the Chinese withdrew from metropolitan Shanghai. However, because the Nine Power Treaty Conference was to be begin in early November, Chiang Kai-shek ordered his troops to stay in the Shanghai battlefield, instead of retreating to the Wufu and Xicheng Lines to protect Nanjing. He also left one lone battalion to defend the Sihang Warehouse in metropolitan Shanghai. Chiang also visited the frontlines to encourage his troops. Because Shanghai was the most important Chinese city in western eyes, the troops had to fight and hold on to the city as long as possible, rather than moving toward the defense lines along nameless towns en route to Nanjing. On November 3, the Conference finally convened in Brussels. While the western powers were in session to mediate the situation, the Chinese troops were making their final stand in Shanghai and had all hopes for a western intervention that would save China from collapse. However, the Conference dragged on with little productivity. Japan was invited to the Conference twice but declined, thus a mediation effort directly involving Japan was out of the question. Similar to what had transpired in the League of Nations conference, the western powers, including the United States, were still dominated by isolationism and appeasement. Thus, nothing effective was formulated. On November 5, the Japanese made amphibious landings at Jinshanwei to surround the Chinese troops still fighting in the Shanghai warzone. Chiang was still waiting for the Conference to produce a favorable response and ordered the troops to continue fighting, even though the worn-out troops were in danger of encirclement from the Jinshanwei landings. It was not until three days later on November 8 that the Chinese central command ordered the troops to retire from the entire Shanghai front to protect Nanjing. This three-day delay was enough to cause a breakdown in Chinese command as the units were devastated by continued fighting, and this directly caused the failure to coordinate the defense around the Chinese Hindenburg Lines guarding Nanjing. On November 24, the Nine-Power Treaty Conference convened for the last time and then adjourned indefinitely, without producing any measures that would stop Japanese aggression. In his report, General Chen Cheng wrote that throughout much of the Shanghai campaign, sound military strategy was often supplanted by political strategy. It was the nation's tragedy that political strategy, especially the one as precarious as the hope for foreign intervention, forced the troops to make exorbitant sacrifices in Shanghai and led almost to total annihilation. He wrote that because China was weak, it was in dire need of foreign help and had to sacrifice just to prove its capacity to fight and will to resist. By the end of the battle, even though hundreds of thousands of Chinese troops died just to make the point that China was ready to sacrifice, the final hope for a western intervention never materialized. In terms of its long-term effects on the war of attrition, the Battle of Shanghai bought enough time for the Chinese government to move some of its vital industries to Wuhan and Xian, and from there to Chongqing, China's wartime capital. The difficulty in dismantling and relocating thousands of tons of machinery and factory equipment, especially in the heat of Japanese bombing campaigns, meant that the Chinese government fell short of its goal of moving the entire industrial base in the Shanghai region. Many factories were destroyed during the fighting and lost their usefulness. Of the nearly twelve hundred factories and workshops of all sizes, only slightly more than ten percent made it out of Shanghai. However, as insignificant as they were, these factories formed the core of China's wartime industry, especially in the bleak days of the blockade of the entire Chinese coast, the closure of the Burma Road, and the low tonnage of supplies flown over the Hump. Chiang Kai-shek's strategy of bringing the fight to Shanghai to force Japan to adopt an east-to-west direction of attack also prevented Japan from cutting right into Central China. As a result, the Battle of Wuhan was delayed for almost a year, and the time bought gave the Chinese government a breathing chance during which it recuperated and relocated more resources to Chongqing. Overall, even though Chinese losses were irreparable, the strategy of trading "space for time" proved its worth. The Battle of Shanghai was a military defeat but a high point for Chinese nationalism. The beginning of full-scale war meant that China would no longer stand idly and allow Japan to conquer its territories piece by piece as it had done in the past. It also demonstrated China's resolve not to surrender even in the face of overwhelming firepower. However, Chiang Kai-shek's order to have his troops make one death stand after another greatly sapped his strength and directly caused his army's inability to defend Nanjing for even two weeks. In his memoir, General Li Zongren pointed out that Chiang's staff had proposed that the Chinese army reserve around ten divisions along the Wufu Line to protect Nanjing and felt it made no difference if Shanghai could be held for a few months longer at the expense of huge casualties. However, as China was not able to defeat Japan single-handedly, Chiang believed the best option was to bring the western powers into the war by eliciting international sympathy through courageous Chinese resistance at Shanghai. Also, Chiang Kai-shek probably did not realize that the war would last as long as it would - eight years. In his correspondence with Hu Shih, Chiang wrote that China was capable of withstanding six months of combat before changes in the international situation would have to end the war. This may have also caused Chiang to devote all of his best troops in the first battle of what would eventually become a prolonged war. However, while Chiang's initial assessment was overly optimistic, China continued to fight for eight more years until Japan was finally defeated after the atomic bombs were dropped on Hiroshima and Nagasaki. Wikimedia Commons has media related to Battle of Shanghai. Nationalist China At War 1937-1945 published by the University of Michigan, Ann Arbor, in 1982. Doctoral dissertation on the Shanghai-Nanking Campaign from the National Taiwan University. ↑ Faber, John (1978). Great news photos and the stories behind them (2 ed.). Courier Dover Publications. pp. 74–75. ISBN 0-486-23667-6. http://books.google.com/books?id=DqwLVaPdDgoC&pg=PA74. ↑ 2.0 2.1 Higashinakano Shudo, Kobayashi Susumu & Fukunaga Shainjiro (2005). "Analyzing the "Photographic Evidence" of the Nanking Massacre (originally published as Nankin Jiken: "Shokoshashin" wo Kenshosuru)". Tokyo, Japan: Soshisha. http://www.sdh-fact.com/CL02_1/26_S4.pdf.